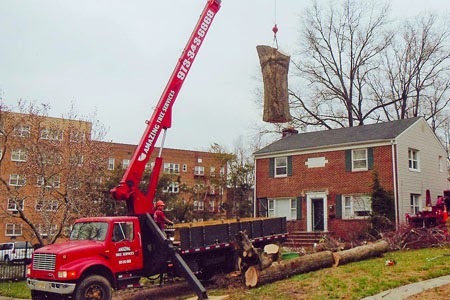 Tree removal is a process that should be completed by trained professionals who have knowledge about how to remove trees from properties in a safe, efficient manner. Dead or dying tree: A tree that is dead or in the process of dying is not a tree you want to leave standing on your property. Dead trees can pose many risks, including that they can rot and fall without any warning. This puts homeowners, neighbors and passerby in danger all of the time. Diseased tree: You always want your trees to be healthy. If you notice that you have a sick tree, you will want to do your best to treat and cure it. If your tree is unresponsive to these methods, you will have to remove it from your property. Dangerous growing patterns: If you have a tree that is near power lines, the road or your home, you will want to consider its removal. Trees in these areas are very dangerous, and in the event of poor weather conditions, can fall down quickly, causing much more damage than if they were away from these locations. Weather damaged: Storms can cause a lot of damage to homes, yards and roads, but can additionally cause a lot of damage to tree trunks. If tree trunks are severely water damaged, they can cause the tree to fall down much more easily. Root dangers: If your tree has a lot of roots that are emerging above ground, this can be dangerous to the surrounding areas such as your home, sidewalk and driveway. Roots can also be dangerous to people. The roots will never disappear underground, so one of the best solutions is to remove the tree. Aesthetics: If you have a tree on your property that is blocking your view and trimming and pruning do not help, tree removal services can be completed to get rid of the tree. Additionally, if there is a tree that is taking up a lot of space in your yard, you can also remove it to create more space. If any of these situations apply to a tree on your property, consider contacting Amazing Tree Services. 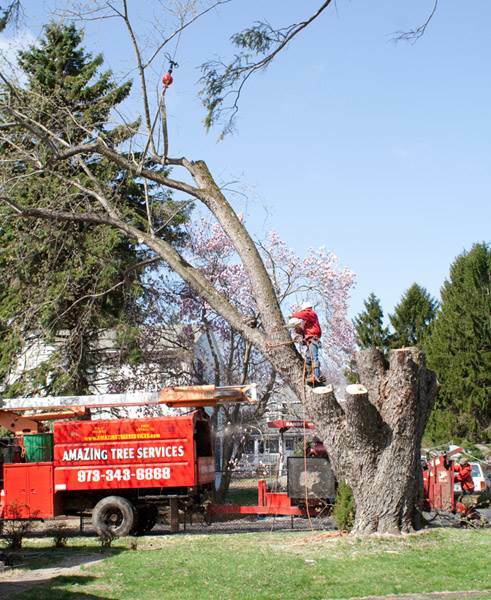 At Amazing Tree Services, our professionals can quickly and efficiently remove trees from your yard after doing everything we can to salvage them for you. If your tree needs to be removed, our experts can provide you with a free estimate for tree removal in Montville. Now that both Christmas and New Year's are over, it is time to get rid of your Christmas trees. Many towns throughout New Jersey are beginning their NJ tree removal programs next week. Residents are asked to remove any tree decorations or tinsel before bringing their trees to the curb. While it may be easy to get rid of of a Christmas tree, it is considerably more difficult to remove a dead or dying tree. These can be hazardous to leave in your yard, and difficult to remove without the right equipment. They can easily fall on people or property that lies underneath. We own all of our equipment so we can keep prices low since there are no rental fees. If you would like more information on tree removal in NJ or any of the other services that we provide, contact Amazing Tree Services.